"Given your presentation at Critical Care in Respirtory Distress, and the history of your injury, I am not convinced that you would have survived another night at home." There are five infectious disease doctors trying to figure this all out. I have two chest tubes and had surgery to clean out the whatever. I asked, is this life-threatening? Doctor said, "It was. I think we've got it." Now I am looking out my window at this Italian Gothic building, the only piece of the original 1874 Maine General Hospital left standing. So thankful you went to the hospital when you did. And are feeling well enough to keep us posted. Get well thoughts heading your way!! 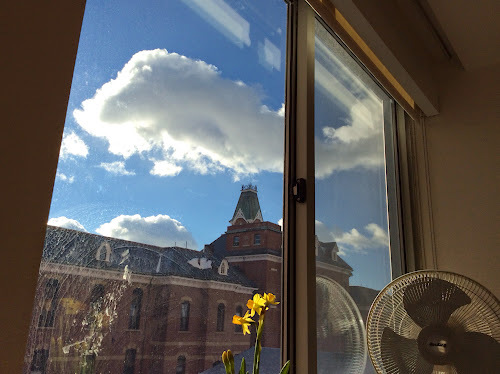 Right now you must feel as luminous as the blue sky, the clouds and that pretty golden daffodil. And for you that view out the window is worth million bucks. With all that love and medicine you surely will be well and on the way home sooner than later.